Treachery and treason: a pact with a djinn betrays until time crumbles to dust. The ancient, cultured realm of Myklaan is under threat. Addiction to a devastating drug is spreading, magic is fading from existence, and its powerful neighbour, Terlaan, is poised to wage war over the theft of a mystic crystal its mages cannot spark. With Shah Ordosteen besotted by his scheming bride, and his heir intent on rescuing the Terlaani princess from patriarchal Verdaan, the criminal underworld is holding addicts to ransom. But Ordosteen’s niece, Lady Jordayne, is not one to sit idle while her people suffer. When a poor man’s djinn brokered deal goes horribly wrong, she sees beyond the ruined lives to the possibility of salvation. After all, she can manipulate family and stranger as well as any djinn. If she can just bear the very personal cost. Betrothed to a cruel lord, Princess Kordahla dreams of fleeing to her decadent neighbour, a journey fraught with danger, and no promise of sanctuary at its end. Her one hope is to offer the southern shah a prize so valuable he cannot refuse to harbour her: the secret of the mahktashaan , the soldier-magicians sworn to protect her father’s court. Currently available for order from Amazon. Discredited journalist Ella Jerome isn’t thrilled about working at Adelaide’s fanciful tabloid The Informer. So when zoologist Adam Lowel seeks her help in finding his missing cousin, she’s cynical of his claim a monster lurks near the Church of the Resurrection. The trouble is, solving the gruesome case could be her best shot at restoring her reputation. With her old instincts resurfacing, Ella combs the port for clues. Experience tells her the only monsters are the human variety, and the bloodied stonemason certainly raises her suspicions. But when her investigation turns up everything from petrified human remains to the headless carving of a dragon, the truth threatens to steal both her sanity and the man she’s falling for. 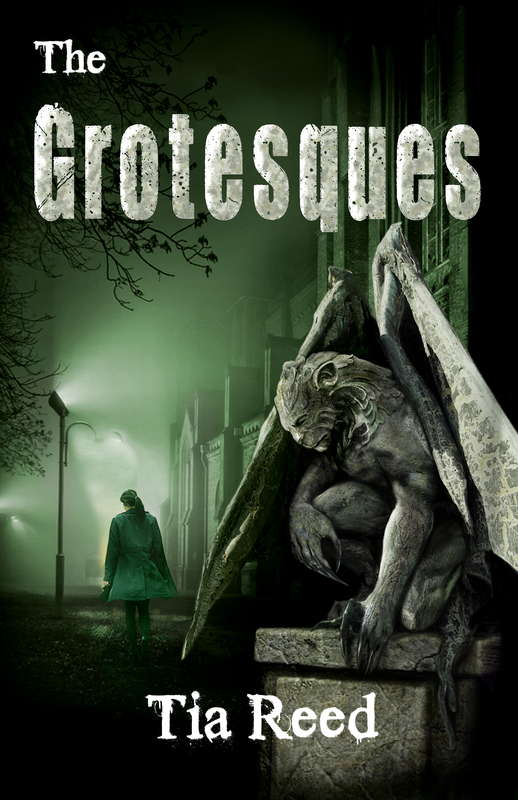 The Grotesques, published by Tyche Books, is out on Amazon in time for Halloween. The amazingly talented cover artist is Heather Dickson.